What is lawn scarification and will my lawn benefit from it? Lawn Scarification removes organic matter from your lawn. This organic matter, made up of grass clippings and other dead or decaying plant debris, forms a thatch layer that weakens your lawn, encouraging moss and weeds to grow. This thatch layer can build up over time, and if not removed, it will begin to cause visible problems such as patchy and mossy lawns that are not drought tolerant. How do you scarify a lawn? The best way to scarify a lawn is with a vertical mower with steel blades spaced out along a reel that cuts out the thatch layer. These blades also trim the grass, cutting downwards rather than the usual cross-cutting motion when you mow. This type of cutting encourages extra shoots to grow, and as a result, your turf thickens. This type of cutting action helps control creeping weeds including trefoil and speedwell. You could also cut into the soil to open up the surface as this produces an ideal environment for introducing new grass seed to your lawn. After we carry out scarification, your lawn’s going to look pretty dreadful. Don’t be alarmed by this as the impact of scarification leads to a stronger lawn that will allow air, nutrients and water to pass easily into it. Now space has been generated around the base of your grass, you can encourage new growth to fill the area. However, you don’t want gaps to be filled with unwanted weeds or weed-grasses. After scarification is an ideal time to over seed your lawn to repair thinning patches. It also thickens your grass, which improves its appearance and lessens the growth of weeds and moss. Green Mile Lawn Care’s scarification process is finished with our post scarification treatment, which will supply the roots with vital nutrients and now that we have opened up the lawn, we are able to tackle any moss left in the lawn to stop it grabbing a foothold again. Your lawn will start to look its best in around 8-10 weeks after scarifying and will benefit from allowing it to recover from scarification before using it (and water it, if it doesn’t rain), you’ll see your lawn change from dull brown to a lush green carpet. When should you scarify a lawn? Your lawn needs time to recover after scarification; therefore, it’s important it’s only carried out at appropriate times. If you scarify too early in the year, the grass will not grow strongly enough to fill the space created. After scarification is the perfect time to seed your lawn, but too much water will cause the seed to rot. The soil should be kept moist but not soggy. It will be 3-4 weeks before the seed germinates and this can take longer in colder weather. Would you like to find out more about scarification? If you’d like to discover what scarification could do for your lawn, call Green Mile Lawn Care on 01252 313305 or contact us via our website www. 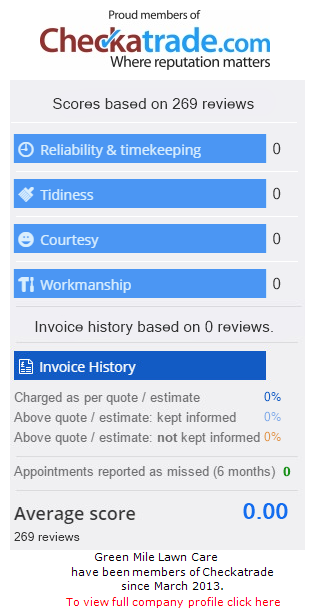 greenmilelawncare.co.uk for a free survey. Error: Error validating access token: Session has expired on Monday, 01-Apr-19 12:00:47 PDT. The current time is Saturday, 20-Apr-19 01:55:00 PDT.